Still can’t make up your mind on which postpaid plan to subscribe to because there are just too many? 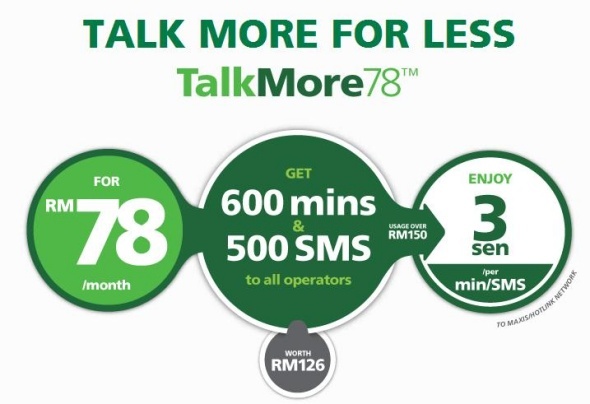 Well, here’s one more from Maxis – TalkMore78 that is packed with values worth RM126. Maxis has been buzy introducing new postpaid plans recently, not too long ago, the telco introduced TalkMore28 and TextMore28 catered for light users and if whatever that is bundled there isn’t enough for you, TalkMore78 comes with up to 600 minutes and 500SMS to all operators.The value is worth RM126 and if your usage for a month exceeds RM150, you can enjoy lower call and SMS rates to Maxis and Hotlink network at only 3sen/minute/SMS. If you exceed the bundled voice and SMS, you can call and SMS at 8sen/min and SMS to the same network, or 15sen/min and SMS to other networks. There are no phone bundles with the plan yet so if you’re hoping to buy a new device at a subsidized price from Maxis, check out the telco’s device bundle page. Alternatively, if you wish to sign up to the new postpaid plans, check out the bundle with TalkMore28/TextMore28 and with TalkMore48.